In case nobody has noticed, the opening words of our Federal Constitution begin with the words, “We the People.” Please note it does not begin by paying homage to the King, the President or the Mayor, they are ALL subordinate to “We the People.” To put it another way, our several governments were created BY THE PEOPLE, not the other way around. We are now in great danger however as our “public school” systems have been taken over by collectivists that are actively teaching the ideal form of government is communism, instead of a Republic. Did you catch that? The United States of America was formed as a Republic, but has degenerated into a “democracy.” The latter being a form of government that has been aptly called, “tyranny of the majority,” and is just one step away from a communist dictatorship. A democracy is governed by the will of the majority. If the majority decides blue eyes are bad they can simply outlaw them by majority vote and imprison all the recipients of such a bad physical feature. Next week however, the blue-eyed people can get in office and put all the brown eyes in jail. 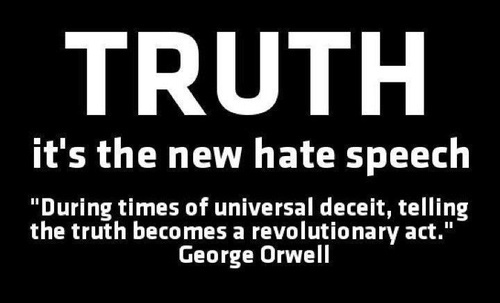 It has been a deliberate effort on the part of collectivists to gradually change our Republic into a mongrel society called a “democracy” as the media constantly calls us. “A Republic, if you can keep it.” He replied. When I was a kid going to school we had what was called “Civics,” I don’t know what it’s called today or if they even have it. 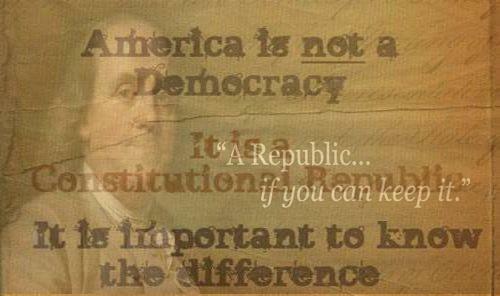 In Civics we were taught the fundamental differences between a democracy and a republic. As stated, the former is tyranny of those in charge, where in a republic the majority is restrained by LAW. Written law to be exact, such as in the United States and the State Constitutions. All of which require deliberation and vote of super majorities by amendment before the LAW can be changed. However, in spite of the safeguards established to protect us, strong and ambitious men have conspired to convince us of the lie either the President or the Judiciary is the “law of the land,” effectively getting our eyes off the real law, our “written Constitution.” That founding document was written, not spoken, for the simple reason written documents are much harder to distort and/or subvert, to change their meaning. In addition we should note, read and understand that the Judiciary is not granted the power in our Constitution for a power crazy Federal Judge in Mayberry or some other seaport to render the power of the President ineffective. 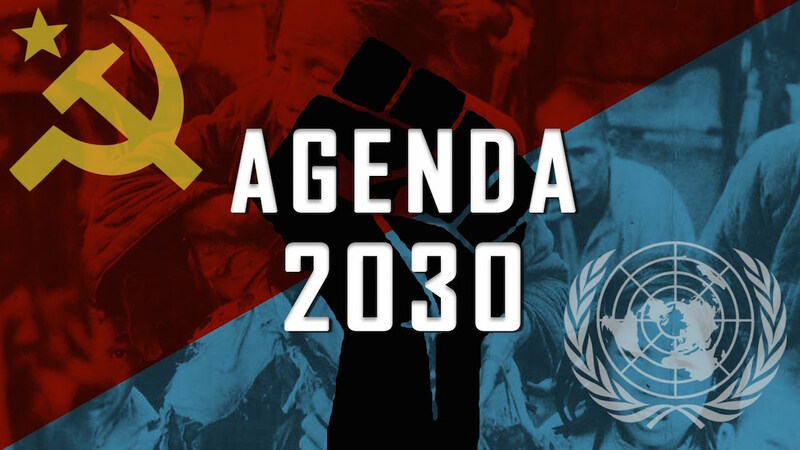 The courts have assumed that power under The Federal Rules of Civil Procedure, Rule 23, being aided and abetted by people in both government and the media who are working toward world government patterned of the communist model. Look it up. This is made clear in an article by Andrew Kent, Professor of Law at Fordham University School of Law. It shows that “…the national injunction is a recent development in the history of equity, traceable to the second half of the twentieth century.” Another important article dealing with the limitations of government can be found at “Perspective”. Following is the pertinent power granted to Congress to “ordain and establish” courts inferior to the supreme Court. It should be axiomatic if Congress has the power to create courts it also has the power to abolish them and/or to regulate their behavior. Article 3, Section 1 The judicial Power of the United States, shall be vested in one supreme Court, and in such inferior Courts as the Congress may from time to time ordain and establish. The Judges, both of the supreme and inferior Courts, shall hold their Offices during good Behaviour, and shall, at stated Times, receive for their Services, a Compensation, which shall not be diminished during their Continuance in Office. In related moves, lawyers have built edifices called “Case Law” and “Supreme Court Decisions.” These are also NOT settled law, no matter what Judge Gorsuch or Judge Roberts or others say or think. Both can be overridden (and often are) and rendered null and void by later decisions (opinions) of the high court, the proof of which is later opinion that are in opposition to previous opinions, and those opinions can be overridden by even later decisions. Such miscarriages of justice can be immediately challenged by nullification, which will be the subject of a later article. In short, we have been hoodwinked into believing the opinions of men (both men and women wearing long black robes), have more validity than our written law. The jurisdiction of judges can also be limited by Congress simply BECAUSE Congress has the power to “ordain and establish inferior courts.” ALL legislative power is vested by our Constitution in the CONGRESS. Courts, whether they be “supreme” or “inferior” can only render OPINIONS. They have no power to legislate by fiat. Only Congress can establish courts AND they can un-establish and re-establish them and at the same time limit their jurisdiction by rewriting the rules of conduct. For example, a properly constituted district court, say in northern Colorado should by law have their opinions apply only to that district of northern Colorado. Also recently (week of July 6, 2017) a federal judge in Hawaii recognized at least part of limitations on his legal authority; admitting “[a] federal judge in Hawaii ruled on Thursday afternoon that he has no power to cut back on the scope (underlining added) of the Supreme Court order last week allowing the Trump Administration to enforce, in part, its new restrictions on immigration of foreign nationals and refugees. I would note that Trump’s lawyers are should be well aware of the power of Congress (if they don’t they should be immediately discharged) to regulate the judiciary, and should forthwith advise him to petition Congress to take the necessary steps to limit the jurisdiction of all Federal judges. We MUST again become a nation of laws, not the opinions of criminals posing as lawyers and politicians. In the old days gangsters such as Al Capone used machine guns to gain power and rob the people. Today the outlaws wear three-piece suits and have a lawyer on each arm. They also own an army of lobbyists who persuade, bribe, cajole, threaten and blackmail members of Congress to vote for particular bills that will extend the power of those who already own most of the world. We note if there was a media outcry at the actions of previous Presidents limiting immigration, it came to nothing, because the orders stood. President Donald Trump has the power to issue his order and if an inferior court renders an opinion against it, take it to the Supreme Court, and in the meantime have the order enforced i.e. put into practice until such time as the Supreme Court rules. Why do I mix an article about hate crimes and hate thoughts with comments on the limitations of the judiciary? Because eventually hate crime legislation must be brought back under control because such decisions can be our undoing, if a renegade judiciary is not first brought under control by our Congress. Will you petition your Congressman to address the issue of judges run amok? Will “Amerikans” wake and take their country back? It’s not likely. Ball games and beer are seemingly more important to most men than freedom itself. It’s more important to be a big shot by being able to quote ball game statistics than to know where our freedoms come from, our written Law and the Ultimate Lawgiver on Mount Sinai. It seems more important to have a night out with the “boys” than to fight to preserve freedom for our children. It seems more important to puff ones self up, than to acknowledge the God that gives life and who has the power to take it away and cast us into hell forever. Mt 5:17 ¶ Think not that I am come to destroy the law, or the prophets: I am not come to destroy, but to fulfil. What does freedom mean to you? The video below offers an interesting perspective. If we'd ask a million different people what freedom means to them, we'll probably get a million different answers.